The events page details Chance for Charlie's upcoming event details. Keep up to date with all the upcoming events. On Charlie's request we shall be putting together a fete to celebrate the Royal Wedding. The event will be on the 19th of May, 12pm - 4pm at Clayfields, Claypits Lane, Dibden. We will have a guest appearance from Cinderella - Fairytale Kingdom and Scotty the Clown. 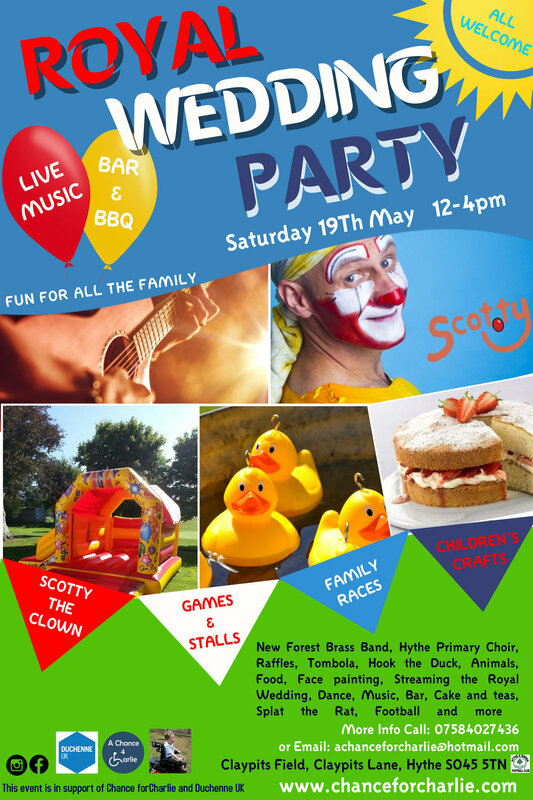 We will have stalls, traditional fete games, British team sports, Bouncy castles,crafts, Cakes and pop up tea rooms, bar, burgers, live music from Natalee Peterson and Ryan, Mike Vaughan, Hythe Primary Choir, New Forest Brass and Shine Studios. We hope you can all join us in some tradition English fun. We will be holding our annual Halloween evening. Following on last years success we have plans to make this year even better! Dress up in your Halloween outfits and join us, pretending to be Zombies as we walk through Hythe with some scares along the way. We shall have the usual stalls such as splat the rat, hook the halloween duck, Lantern making, Pumpkin competition, voted for by the public, live music, dance performers and much, much more.